JEROME FRANK, a mid-20th-century legal thinker, is said to have claimed that justice is a function of what the judge had for breakfast. Don't let their black robes, serious miens and pledges of fealty to the law fool you, Mr Frank warned: judicial decisions are not cool applications of objective legal principles. Rather, they are manifestations of personal predilections and biases. Justice Owen Tagu delivered a political speech coined as a judgement when he acquitted Wicknell Chivayo. If Justice Tagu was not a judge his utterances during the delivering of the judgement would have been inappropriate, 'idiotic' and 'ludicrous' he made comments towards the state accusing the state of having a punitive prosecution which was politically biased. To say that there was an underhand suggests that our state lacks dignity and is mafia style operation. This was way out of line and indeed requires corrections. The court descended in the arena and it made its judgement to be clouded by the dust of the players in the arena. The convention that judges should not be criticised because it undermines confidence in the rule of law has endured here and in many other countries. But where judges wonder in the field which is not theirs they surely invite the wrath of the rational thinking people. The rulings a judge makes can arouse strong feelings, and there are occasions when a judge's rulings might lead a reasonable person to question whether that judge would be able to be impartial in handling any subsequent proceedings involving the same parties. . because a judge's rulings cannot normally be shown to have be attributable to an "extrajudicial source," and can only in the rarest circumstances evidence the requisite degree of favouritism or antagonism when no extrajudicial source is involved, such rulings alone almost never constitute a valid basis for a disqualification motion. The same is true of a judge's comments. The Code of Judicial Conduct admonishes judges to be courteous to litigants, observe proper decorum, and to be cautious and circumspect in their choice of language. Nevertheless, judicial bias will not ordinarily be presumed on the basis of a judge's random remarks - particularly when they were made inside the courtroom. .but these comments usually demonstrate that the judge has formed a fixed opinion with regard to the ultimate merits of the matter pending before him. As for judicial conduct, a judge is expected to maintain a calm and impartial demeanour; and, generally, to avoid any action that might suggest bias or favouritism toward any of the parties. However, the fact that a judge has been appointed to the bench does not obligate him to abdicate human emotion; nor is he compelled to behave as if he were an umpire or referee who must remain mute until a party calls upon him for a ruling. A judge generally has the power to direct a trial along recognized lines of procedure, in any manner reasonably calculated to bring about a just result; and he may take all steps reasonably necessary to ensure the orderly progress of the trial, and the orderly administration of justice – including participating in the conduct of the trial itself. Thus, the discretionary actions a judge takes to control a proceeding pending before him must be seen to be fair. Especially where the judge comments in a judgement his words become a lasting impression. Tagu's comments have re-ignited the debate over whether judges are held sufficiently accountable when there are questions around their competence, impartiality and equality of treatment. This issue attests to the increasing significance of the empirical study of judges and judicial decisions. The comments by the judge is the latest in a cataract of judgements that show that the political biases of judges, and other legally irrelevant characteristics of judges (such as political inclination and reason ), influence the reasoning patterns of judges and the outcomes of cases. The right of a defendant to a fair trial is an essential feature of any criminal justice system that respects the rule of law and, as such, is inscribed in the majority of modern-day constitutions. In countries with representative governments, criminal trials are typically decided by juries drawn from the local population in a manner intended to create representative participation in the legal system analogous to that in the political system. Zimbabwe follows a system where the deciding powers is vested in the judge with the belief that he is fair and will not wonder into politics. The latter practice has become increasingly controversial in light of the surge of corruption cases committed by those who were friends of those still controlling the judiciary. Judge Tagu in a judgement he made a ruling that "apart from being suggestive of a skirmish, a mere witch hunt and a fishing expedition it tells more of a hidden hand or mala fides intention in the institution of the criminal proceedings brought about by state in the circumstances" the judge accused the state for being controlled by an under hand. In effect the judge rubbishes the whole prosecution to be a mafia run by a godfather. These diabolic comments are toxic and bring disrepute to the prosecution at large and the state in particular. This comment in itself is a statement which is coined by the defence attorney and not by learned respected judge. We have hoped that the sanctity and straightness of judges may provide a basis for popular legitimacy, the integrity of any justice system ultimately depends on how close it comes to achieving the abstract promise of a fair trial for all defendants. A particular concern is often whether judges exhibit systematic biases for or against certain defendants (or victims) in a way that impacts verdicts beyond the objective quality of the evidence in the case. There should be a system to eliminate all such bias. Despite the fundamental importance of these questions for the fairness and integrity of criminal justice systems, there is surprisingly no evidence to support the outburst of judge in that the state has been reduced to Mafia. The judge was supposed to restrict himself to the case and stop running around pocking the state in comments which were not presented before him to deliberate on. It was difficult to draw strong causal conclusions about the allegations the judge bellowed out against the state and the government. The comments of the judge show that verdicts are not simply a function of the objective quality of the evidence in the case; rather trial outcomes vary systematically with the political opinion of the judge. This kind of behaviour raises concerns about the validity of the findings. The findings of the judge that the state is controlled by a under hand is not only malicious but it is a political ploy designed to bring ridicule on the government at large. The judge tried to show a pattern by citing two other cases of the other judges, which are not binding to him but only persuasive. He commented that those two cases showed that the state's behaviour was not a coincidence. This did not refer to legal point but to facts. The facts alone could not be the basis of a finding. The judge crossed the line and lifted the skirt of his privilege by swimming into political waters which had nothing to do with the case. in normal circumstances the judge was supposed to restrict himself to the case before him. The behaviour of the judge had shown serious bias and miscarriage of justice in that he considered facts of under hand of which those facts were never argued before him. The judge was alive to the fact that his comments which were unsolicited would bring the state into a political quagmire. The case was not political the facts were all there, it does not matter whether Wicknell was to be prosecuted or not the point is the issues should have remained as what was brought before him not to aim a gun of embarrassment to the government and the presidential fight against corruption. The judge stated that " Rather ,it demonstrates the extent of common acceptance that the criminal case is at best a causa non grata, a high sounding nothing" This was not called for. The judge misdirected himself as he was overtaken by his personal political emotions. With this context in mind, there is a novel data set of criminal cases tried in the High Court which are politically affiliated. The judge would have simply made his ruling without massaging it with political innuendos. In contrast to the judges reasoning, political ideology has been considered more extensively in other contexts where individuals are politically biased and take every case before them as political. The impact of political ideology in the context of decision making distinguishes itself from the existing justice delivery system. People look at the behaviour with the expectation that litigation is possible in the future will expect that, on average, the judicial response will be unbiased. Now when judges attend court powered by the political opinions and armed with the power to stifle the work of the state in cleaning the society of the corrupt people Justice will escape the just. The effects of letting the criminals free casts doubt on the seriousness of the state to deal with graft. In order to show that the previous government was right in not prosecuting the accused the judges will simply label the current government as working with the underworld. The choice of words in the decision of the Judge speaks volumes of what the state is up against in the fight against corruption. It is not surprising that we have political leaders who attack the institution of justice and we have judges who show the middle finger to the process of justice. The case did not need extra comments on the personal thoughts of the judge which were not prompted by any fact before the court. The judge relied on what he has heard and incorporated it in his judgement. The judgement then became tainted with bias and probably meant to embarrass the state. 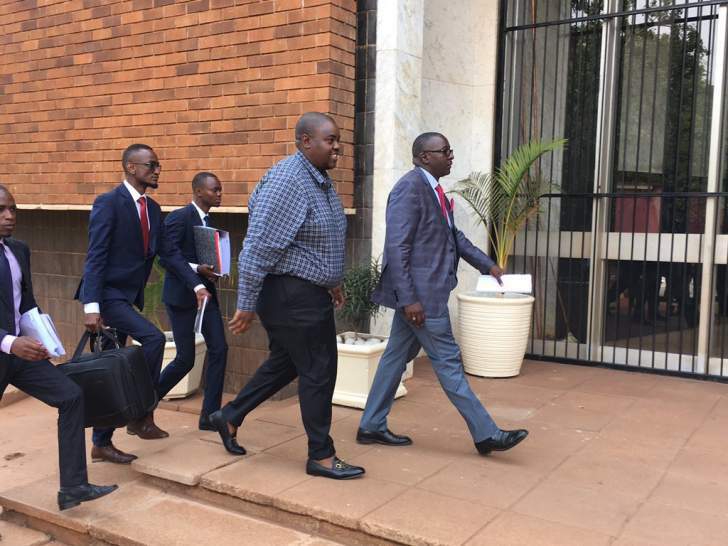 The point on Mr Chivayo's case is not why he was acquitted but simply why did the court find it necessary to call the state an institution pushed by underhand. This issue of high sounding nothing was never brought for review by the defence and the comments by the judge became political comments. The judge became a player in the game and forgot to be the referee. It is simply reasonable to stick to the facts presented or at least the court should have requested the state to explain what the judge believes was a pattern. in an unfair comment the judge did not see the pattern in the corruption accused persons but only found it prudent to lambast the state and lowers the trust of the people in the justice system of Zimbabwe.